In 1886, Robert T. Whalen and John L. Whalen from Liverpool, England, purchased the deed for 225 Grand Street and opened up Whalen Brothers Furniture Store. Originally a small, three-story, brick building, the successful furniture store expanded in 1897. The lot for this property combined addresses 219-227 Grand Street and 681-693 Driggs Avenue, and became 227 Grand Street. The store was then expanded to a large, three-story, brick building covered with light-colored paint and a dark bronze-colored cornice bordering the top of building. There was also a portion in the middle of the Driggs Avenue facade that was reduced to one story. The Whalen Brothers Furniture Store went out of business in the late 1930s. Between 1946 and 1951, Kitzler & Nurick, Architects and Engineers, submitted permits for a building alteration. The top two levels of the store were removed and the structure was converted to a one level retail space. All existing brick paint, cornices and projections were removed from the building façades, and a coating of stucco was applied to the building. All window openings on Driggs Avenue were filled in and coated with stucco. The 1980s tax photo for this lot shows a single story brick facade partially covered in a chipped, light colored stucco with a sign that reads “Mandler Paper Company.” The property changed ownership numerous times until 2006. 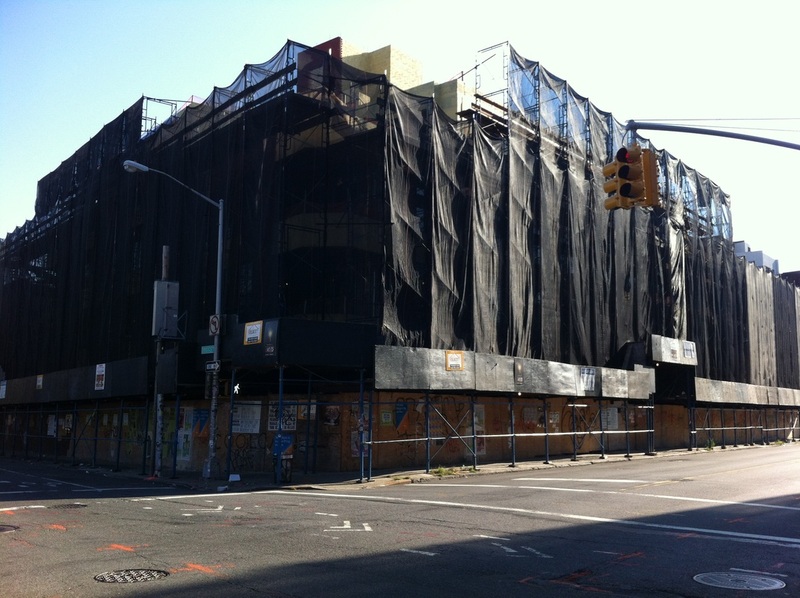 After the 2005 Williamsburg Rezoning, the lot was purchased by 225-229 Grand Street Holdings, LLC in March of 2006. The original building was demolished and construction of a 16-story condominium complex began in late 2007. In 2008 the Grand Street Rezoning passed, at which time builders missed the necessary construction deadlines to be grandfathered in under old zoning regulations. The Department of Buildings halted construction until the developer redesigned the project under new zoning laws. A redesign by architect Karl Fischer came in the form of a four-story, 50 foot retail/office building, and eventually further redesigned as a four-story retail/residential building. The lot remained vacant until construction began in 2010. 2011. Photo taken by Maurice Robb.